Sculpture Garden Ice Rink (between 3rd and 9th streets NW along Constitution Avenue) — Bring friends for an artsy spin in the National Gallery of Art's Sculpture Garden on the National Mall. The rink's perfect soundtrack will get you pumped to stay even once you get chilly. Open from Nov. 19 through March 10, weather permitting. Rates: $9 adults; $8 kids and adults 50 and older; $4 skate rentals. Washington Harbour Ice Rink (3050 K St. NW) — This Georgetown rink is billed as D.C.'s largest. You'll find it at the Georgetown waterfront surrounded by restaurants... just in case you need to warm up with a tasty bite when you're done. Open from Nov. 18 through March 1. Rates: $10 adults; $9 kids, seniors and military; $6 skate rentals. Canal Park Ice Rink (202 M St. SE) — If you're looking to spice up your skating experience, check out College Night on Thursdays, Rock n Skate on Fridays or Cartoon Skate on Saturdays. Open November 20 through February. Rates: $9 adults; $8 kids, seniors and military; $5 skate rentals. Two admissions for the price of one on Tuesdays. The Wharf Ice Rink (Transit Pier, The Wharf) — Glide right over the Potomac on The Wharf's Transit Pier Ice Rink. Southwest residents who have a valid ID showing a 20024 zipcode get $2 off on Mondays and a live DJ will get the party started on Friday from 8 p.m. to 10 p.m. Open Dec. 2 through February, including holidays. Rates: $10 adults, $8 for active military with ID, seniors with ID and children 12 and under. Silver Spring Ice Skating at Veterans Plaza (8523 Fenton St., Silver Spring) — This covered (but outdoor) rink is smack in the middle of downtown Silver Spring. After you're done skating, explore the surrounding restaurants and shops. Open now through March 25. Rates: $9 adults; $8 kids and adults 55 and older; $5 skate rentals. Pentagon Row Ice Outdoor SkatingPlaza (1201 S. Joyce St., Arlington) —Grab your friends and skate adjacent to the Pentagon City area's abundant restaurants and stores. Visit Dec. 1 from 5 to 8 p.m. for Frost Fest, featuring live entertainment, DJ Har-V, food samples and a giveaway for a $500 shopping spree, and ending with an on-ice firework display with a special appearance by Santa. Open late October to mid-March. Rates: $9 adults; $8 kids and adults 55 and older; $5 skate rentals. The Loy E. Harris Pavilion (9201 Center St., Manassas) — Take a spin on the ice in Old Town Manassas. Opens in November. Rates: $9 adults; $8 kids age 10 and younger; $5 skate rentals. 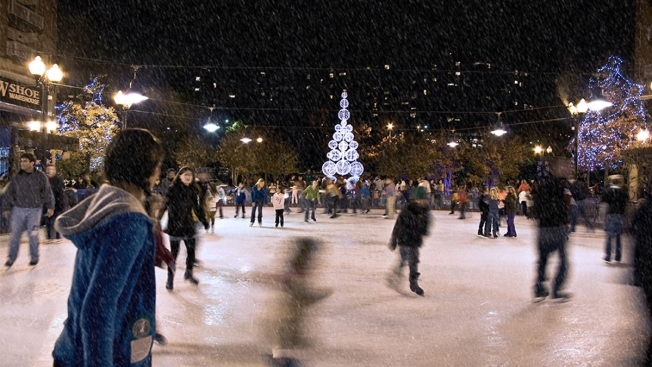 Reston Town Center Ice Skating Pavilion (1818 Discovery St., Reston) — The outdoor pavilion at the Reston Town Center will be sure to get you in the holiday spirit. You may want to arrive a little bit early to check out all the nearby shopping. Open early November through mid-March, Rates: $10 adults; $9 kids under 12 and adults 55 and older; $6 skate rental.